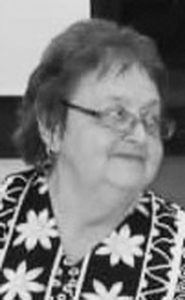 MONA GAYLE (LUCIANI) MILLWARD, beloved wife of the late Ronald Millward, passed away March 4, 2019. Mona was born on April 7, 1947 in Lethbridge, AB to Helen & Ernest Luciani and a very special sister Marlene. Mona was raised and educated in Lethbridge. When she was a young teen she met Ronnie Millward and they were married on November 27, 1965. Mona & Ron moved to Fort Macleod, then Lethbridge, before settling in Coaldale in 1969 to raise their family. Mona’s happiest memories were those spent with family and friends; everyone knew that the door was always open and coffee pot on with cookies or pastries to share. She was always ready for a camping trip, looking forward to family stories and good times. Mona is survived by her children; Rhonda (Vern) Coatney, Raeleen (Rob) Sonnenberg, Russell (Monika) Millward and Rochelle Millward. Grandchildren; Joe (Heather), Joshua (Jolene), Matthew (Rachel) & Laura Sonnenberg, Daniel Coatney, Alicia & Deanna Millward. Great-grandchildren; Edith, Jeremiah, Reuben, Greta & Drummond Sonnenberg. Life time friend Heather Johnson, sister-in-law Martha Millward and brother-in- law Don (Irene) Millward. She will be lovingly remembered by many of the Sweda and Luciani cousins, and many nieces, nephews and friends. Mona was predeceased by her loving husband Ronnie, granddaughter Melissa Sonnenberg, parents Helen & Ernie Luciani, sister Marlene, and brother-in-laws Fred Sandercock & Trevor Millward. In lieu of flowers, memorial donations may be made to CRH Foundation, www.crhfoundation.ca or Lupus Canada, www.lupuscanada.org. The Prayer Service is on Friday March 8, 2019 at 6:30 pm at SALMON & SONS FUNERAL HOME (433 Stubb Ross Road S. Lethbridge). The Funeral Mass is Saturday, March 9 at 10:00 am at St. Ambrose Parish (1531, 23 Ave Coaldale), interment to follow at Coaldale Cemetery.